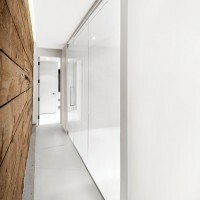 Anne Sophie Goneau has designed Espace St-Denis, a condo located on the ground floor of a triplex in Montreal, Canada. 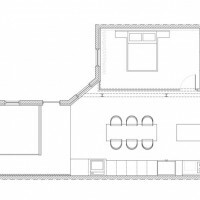 The project is the design of a 1,280 sq.ft. 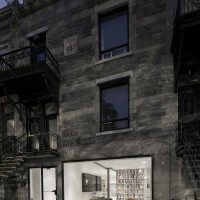 condo, located on the ground floor of a triplex in Montreal. The mandate was to divide each living area in order to maximize while maintaining the architectural integrity of the existing location, each room with natural light. The concept was to highlight the raw materials, discovered during the demolition (brick wall, wall hemlock and steel structure), in order to communicate their material, their relief and color environment. Upon entering the hall is semi-closed hall, so that it has an overview of the condo. The open kitchen is the focal point of the space; it unfolds on the dining room and living room, where the master bedroom fits. It is bounded by a glass wall which preserves the view of the bare brick; an archaeological reminder wanting to highlight the existing raw materials as an exhibitor showcase. A green velvet sofa, two vintage chairs and a bookshelf that leans against the bedroom wall bound the living room. On the ground, a radiant hot water heating system was installed under a concrete slab which was covered by a light gray epoxy and polyurethane matt finish to replicate the natural color of concrete. The primary and secondary bedrooms, as well as the bathroom, are glossy white epoxy to distinguish the private area of the common space. The steel beam, flameproof, delimits the passage area. 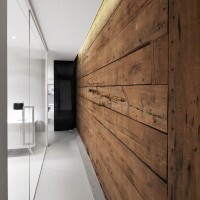 In the corridor leading to the bathroom, a light-emitting diode was installed in the recessed ceiling for a more intimate setting, which features the original hemlock wall. 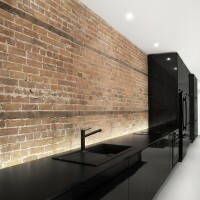 Tone on tone, glossy black kitchen cabinets and electrical appliances are blended. 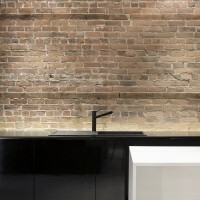 The cooktop with integrated sub-hood, allows maximum exposure of brick wall, the backsplash, lit by a light-emitting diode recessed in counter. The dining table becomes the visual continuity of the kitchen island. 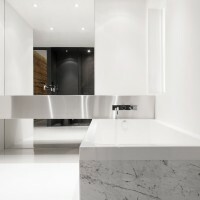 In the bathroom, custom-made stainless steel countertop and bath rectilinear shapes are stacked on each other, forming a sculptural composition. On the floor, a white epoxy and in the shower a dark grey epoxy were applied. 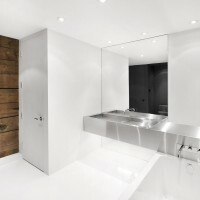 The contrast between these two colors form a psychological boundary of two areas: one is clear and bright, the other, darker, creating a private area for the shower and toilet. The window allows natural light in the room while preserving the intimacy of the space, with a frosted film.